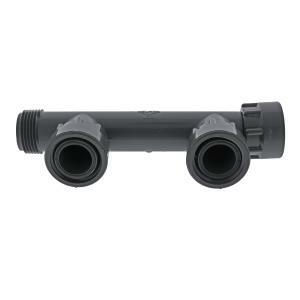 Use this versatile, easy to install Dura 1" NPT Multi-Port Manifold to split your main water source into multiple zones. Can be used manually with simple PVC ball valves or automated using a controller/valve set-up. Gray Schedule 40 PVC fittings have nitril rubber O-rings so no pipe dope or teflon tape is needed. Assemble valves without gluing for an easy to repair/replace valve manifold system. Hand tighten only. This manifold does not come with a 1" end cap. The cap is sold separately. Add additional head assembly components as required for your needs.